Pasternack returns home Robert Laberge/Getty ImagesJoe Pasternack is elated to be back in his hometown of New Orleans. Two years after Hurricane Katrina devastated New Orleans, the local sports scene has provided America with symbolic stories of recovery and renewal. The Superdome is reopened and fully functional, the Saints are inspirational icons instead of the "Aints" of old. The New Orleans/Oklahoma City Hornets have returned home full time to host the 2008 NBA All-Star Game, ending their temporary relocation to the Sooner State a lot sooner than expected. But the city's eponymous Division I program hasn't been able to find any solid footing since the storms, serving as something of a metaphor for the everyday experience of much of the troubled city in the past 24 months -- the side of the Big Easy still immersed in the difficult struggle of returning to routine and normalcy. Not only did the Privateers extend a string of three consecutive losing seasons, the school lost two head coaches to assistant positions at power-conference schools in successive summers. In July, Buzz Williams abruptly left for a support gig at Marquette under Tom Crean, just a year after Monte Towe bolted for his alma mater at NC State. So enter Joe Pasternack, a local product who grew up watching UNO rise from the ranks of the independents to the Sun Belt, spending winter nights at Lakefront Arena with those Tim Floyd-led teams. "This was obviously a goal of mine to become a head coach one day, but to do it in my hometown is a dream come true," said Pasternack. "I love this city. This is my home." The 30-year-old Pasternack has spent the last eight years at California at Ben Braun's side, after filling up binders worth of notes as Bob Knight's student manager at Indiana from 1995 through 1999. He nearly became New Orleans' head coach last summer, but was passed over for the more experienced Williams. "Last year was a terrific opportunity for me to get to know [UNO athletic director] Jim Miller," said Pasternack. "I didn't see [not getting the job] as a failure, I saw it as a great learning experience. I think persistence and perseverance is important. You fail and you come back and you keep going." 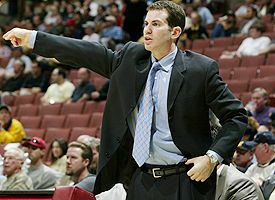 Pasternack indeed came back; his meteoric rise in the profession culminated just 48 hours after Williams' departure, when Miller made him one of the youngest coaches in Division I. The team he inherits returns four starters from a 14-17 season full of more steps back than steps forward, and with everything that's happened the past two summers, you couldn't blame the players if they were feeling a bit apprehensive about learning yet another new system. they've been through a lot. The hurricane, everything that's happened to the city, having to adjust to different coaches. This year will be all about them." But for fans and opposing Sun Belt coaches, it will be mostly about the reigning league player of the year, senior guard Bo McCalebb. McCalebb is the 6-foot scoring dynamo who led the conference last season with a 25 points per game average -- good for fourth nationally -- and scaled the 30-point plateau six times. But according to his new coach, none of those accolades or accomplishments is as impressive as his mere continued presence in New Orleans. "What Bo exhibits is pure loyalty, in actions and in words," said Pasternack. "He has truly shown loyalty. He could have transferred out of here when things got bad. Any SEC school would have taken Bo. Any school in America would have taken him as a transfer. But he chose to stick it out, and that to me reveals his character more than anything else, more than any point he scores." Privateers fans can rest assured that Pasternack will stick around too. There's little doubt that he'll be on the UNO bench in 2008-09 and lead the program for years to come. "There's no place I'd rather be in America than right here at home," said Pasternack. "I'm not just jumping around [to another job]. That's not who I am, that's not where I come from. "Loyalty is the most important characteristic to me. I learned that from my two mentors, coach Knight and coach Braun. Coach Knight was at Indiana for god knows how long. Coach Braun could have left for Michigan on two different occasions. He decided to stay at Cal, and he's the second-most tenured coach in the Pac-10 behind Lute Olson. The most important thing I've learned from them was how to be loyal." In July, Arkansas State announced that it would be changing its nickname from Indians, a moniker the school has used for 76 years. A-State was one of the 18 schools on the NCAA's 2005 list of schools with "hostile and abusive" Native American-related imagery, as its official mascots are a three-person "Indian family" consisting of a brave, a princess and Chief Big Track. Instead of facing penalties, the administration chose to announce that 2007-08 will be the final season as "Indians," and that a Mascot Review Committee would put forward recommendations for a new sporting identity in September. It's not likely that Arkansas State will revive any of its pre-Indians nicknames (the teams were known as Farmers, Warriors and Gorillas from 1911 to 1931), or expand on a red-colored, squiggly haired "spirit character" named Red that looks a bit like a younger, thinner version of Western Kentucky's blob Big Red. The leading candidate in fan polls so far is "Red Wolves." When the school debuts its new nickname and mascot for 2008-09, whatever it may be, Arkansas State will become the second Sun Belt team in three years to make an NCAA-mandated change. Louisiana-Monroe had been known as the Indians, but went with Warhawks for its inaugural 2006-07 season in the conference. The switch seemed to provide some instant positive karma: ULM improved on a 10-18 (6-10 Southland) disappointment with an 18-14 (11-7 SBC) campaign that culminated in a first-ever SBC tourney win (versus Denver) after a surprising East Division first-place tie with those same Arkansas State Indians. Hey, it happens. You win championships and scoring titles and all-state honors in high school, and then you find yourself riding the pine and fighting for minutes behind a bunch of All-Americans at some power-conference school. Thanks to the NCAA's transfer rule, all is not lost: You can sit out a year and resurface at a mid-major program with increased playing time and a shot at March glory. In recent years, "trickle-down transfers" have benefited schools at the mid-major level that can't compete for blue-chippers during the high school phase of player selection. The Sun Belt has been a prime player in the secondary recruiting market. Alex Galindo, a 6-7 forward from New Jersey who leveraged a strong showing at the 2004 ABCD camp into a Kansas scholarship, averaged four points in just 10 minutes as a Jayhawk and resurfaced at Florida International, where he led the squad with 13.9 ppg as a sophomore. Justin Jonus of Troy, formerly of Alabama, became eligible last December and contributed 9.0 ppg to the Trojans. And there are plenty more coming. South Alabama junior small forward Daniel Hayles played in 57 games for Auburn before choosing to play his final two college years in his Mobile, Ala., backyard. Sean Morris, a 5-11 shooter, was fourth in scoring for Colorado State as a sophomore with 8.6 ppg; now he's a New Orleans Privateer. Louisiana-Monroe (Miami power forward Lawrence Gilbert) and UALR (three players) are among the other Sun Belt teams that have bulked up their 2007-08 rosters with power-conference experience. No conversation about the Sun Belt is complete without mention of its expansive geography. The WAC may span from Ruston, La., to Honolulu, but the decidedly lower-budget Belt stretches from Florida International in Miami to the University of Denver, a 2,070-mile drive from end to end. The conference prefers to see its footprint as a political advantage, inviting the likes of Barack Obama and Rudy Giuliani to explore a Sun Belt strategy in next year's presidential election. Indeed, the eight states with member schools hold a rich trove of 113 electoral votes: Colorado (8), Texas (32), Arkansas (6), Kentucky (8), Louisiana (9), Mississippi (7), Alabama (9) as well as Florida (25), where hanging on the rim is less dangerous than any chad. "If you carry the Sun Belt," reads the first paragraph of the conference's preseason prospectus, "you're almost halfway to the White House!" After two initial solid campaigns under Steve Shields, the last two seasons have resulted in year-over-year decline. Last season's 13-17 version was a slow, turnover-prone squad with a single calling card: Rashad Jones-Jennings, who led the entire nation in rebounding (13.1 rpg) as a senior. Jones-Jennings is gone, and Shields hopes to jump-start his 2007-08 squad with a trio of trickle-down transfers: 6-11 ex-Purdue center Johnathan Uchendu and former Ole Miss midsizers Brandon Patterson and Mike Smith. The soon-to-be ex-Indians won the Eastern Division last season thanks to a four-game winning streak, consisting mostly of high-scoring shootouts, to close the regular season. The 3-point shooting dynamo who triggered the streak, 6-3 senior Adrian Banks, returns to attempt to improve on his 21.1 ppg and 47 percent mark from downtown. He'll be helped in the backcourt by 5-11 streaky sophomore shooter Ryan Wedel. But A-State will have to replace departed senior and rebounding machine Isaac Wells (15.8 ppg, 8.3 rpg). Just two years removed from a close SBC title game loss in 2005, the 2006-07 Pioneers devolved into a 4-25 mess and were by all measurements one of the five worst teams in the nation. Sixth-year head coach Terry Carroll took an unexplained leave of absence in December and simply never returned. The university fired him at season's end. Now, a high-academics school referred to as the "Rocky Mountain Ivy" will get a chance to see some super-cerebral hoops thanks to new head coach Joe Scott, who was lured away from Princeton. In his first year at the helm, former Kansas star Rex Walters guided FAU to a fairly successful transition up from the Atlantic Sun Conference. The Owls finished 16-15 (10-8 SBC) and made the ex-guard proud as one of the most accurate shooting teams in the country, leading the conference in field-goal percentage (48.9 percent) and finishing 14th nationally in that statistic. For the push toward the 2008 Sun Belt title, the squad gets a serious shot of postseason experience from sophomore transfer Sammy Hernandez, a key reserve on George Mason's 2006 Final Four team who wanted to play closer to his Miami home. Head coach Sergio Rouco is trying to put the International back in FIU. Cameroonian forward Cedric Essola and guard Erick Nsangou joined the team last season as part-time contributors, as did Serbian big man Nikola Gacesa. After three losing seasons and an overall 33-54 record, including a 12-17 (7-11 SBC) campaign last season that saw the Golden Panthers lose five of their first six conference contests, to say that Rouco needs his foreign-born players to produce is a world of understatement. In the first part of this decade, the Ragin' Cajuns ran off a string of four 20-win seasons and gave Louisville and NC State fits in the NCAA Tournament. Seems a longer time ago than it actually was, mostly due to an offensively challenged 8-21 campaign last season that seemed to last forever. The only ULL regular to shoot better than 45 percent from the floor was sophomore Elijah Millsap, the younger brother of former Louisiana Tech rebounding phenom and current Utah Jazz Paul. The younger Millsap (6-5) scored 12.4 ppg in his freshman campaign and collected five double-doubles in conference games. And he will serve as the face of the Cajuns' rebuilding project. The young 2006-07 Warhawks topped out at 6-foot-8. So they were, not surprisingly, far more effective defending the arc than the paint: ULM's 3-point field-goal defense was 57th in the nation (32.7 percent allowed), but their 2-point D was in the bottom 30 (53.1 percent, 304th in D-I). But the program, just upgraded from the Southland, was led by 5-11 mighty-mite Tony Hooper and his 15.4 ppg. Because of virtually no roster turnover, however, Hooper and the 2007-08 Warhawks will once again top out at 6-8. Kermit Davis' Blue Raiders broke a streak of four straight winning seasons when a five-game skid in February sealed their 15-17 (8-10 SBC) fate. Two steady frontcourt contributors in Tim Blue and Kyle Young graduated, but in the upset win over South Alabama at March's SBC tourney, 6-10 project junior Theryn Hudson may have signaled his readiness to step up. He had a career-high 13-point performance. Hudson spent May at the Pete Newell Big Man Camp. Also keep an eye on junior point guard Kevin Kanaskie, who notched double digits in assists three times down last season's stretch run. The Privateers' fortunes began and ended last season with guard Bo McCalebb, the nation's fourth-leading scorer and an AP All-American selection. He literally had to do it all as a junior: With a nonexistent inside game that yielded the worst rebounding in the Belt, the Privateers' leading rebounder was the 6-0 McCalebb, who finished with 6.3 rpg. Jairo Mendoza, a 6-8 junior, grabbed 9.2 a game at Miami-Dade JC last year, and 6-7 Joseph Fulce was a prize recruit of former coach Buzz Williams at Texas A&M in spring 2006, but spent last season at a military academy after failing to quality academically. After the school's first-ever SBC championship, Mean Green head coach Johnny Jones got a nice green contract extension in May, one that will keep him in Denton until the 2011-12 season. His first challenge is finding replacement backcourt production for the departed Kendrick Davis and Calvin Watson (28.8 combined ppg). But the good news is that the 6-9 Keith Wooden, who scored 16 points on 6-for-9 shooting in the NCAA loss to Memphis, will return as a senior; he and Quincy Williams (10.5 ppg, team-leading 7.1 rpg) make up the most impressive returning frontcourt in the league. After John Pelphrey left to coach Arkansas, Team USA went forward into the past and re-hired Ronnie Arrow, who led the Jaguars to their only NCAA win ever in 1989. Arrow was let go four games into the 1994-95 season after his team gave up 100 points in each contest and went on to build the Texas A&M Corpus Christi basketball program from an idea on a napkin to Southland champs in seven years. Arrow's first -- er, eighth -- Jags squad returns intact from a 19-win season, led by a trio of double-figure scoring seniors that includes 6-5 swing Demetric Bennett (15.3 ppg). The Trojans will have to account for the loss of three double-figure producers, but return a pair of important senior guards: leading scorer O'Darien Bassett (15.1 ppg) and Boo Ramsey, their most prolific 3-point shooter. The long ball has always been the cornerstone of Troy's game, and they just weren't falling in a 13-17 (8-10 SBC) 2006-07 campaign that ended with a 35.6 percent 3-point rate. Head coach Don Maestri hopes to scoop up a few of those misses with 7-foot Australian Tom Jervis, obtained via the juco transfer market, from Bevill State (Ala.) JC. The Hilltoppers seem to have the easiest time of any Belt team in accumulating talent, and the 2007 incoming class is a continuation of Darrin Horn's long-running recruiting streak. Horn nabbed 6-10 center D.J. Magley out from under Oklahoma and Iowa, and 6-5 swing Steffphon Pettigrew was Mr. Basketball in the state of Kentucky after averaging 33.6 ppg as a prep senior. But offensive firepower isn't the problem: WKU missed out on the national postseason for only the second time since 2001 despite a 22-11 record, and lackluster defense (46.3 percent field-goal defense, 11th in the SBC) was to blame. Can the new guys provide some stops? North Texas went dancing last season with a 10-8 regular-season record. Can another Sun Belt team put together an improbable tourney run and reach the national stage? Missed a ShootAround? Catch up here with all the conferences. Kyle Whelliston is the founder of midmajority.com and is a regular contributor to ESPN.com.